This fresh and accessible ethnography offers a new vision of how society might cohere, in the face of on-going global displacement, dislocation, and migration. Drawing from intensive fieldwork in a highly diverse North London neighborhood, Daniel Miller and Sophie Woodward focus on an everyday item—blue jeans—to learn what one simple article of clothing can tell us about our individual and social lives and challenging, by extension, the foundational anthropological presumption of “the normative.” Miller and Woodward argue that blue jeans do not always represent social and cultural difference, from gender and wealth, to style and circumstance. 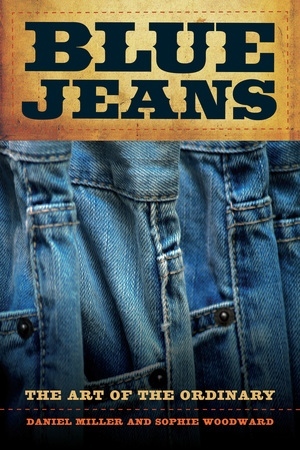 Instead they find that jeans allow individuals to inhabit what the authors term “the ordinary.” Miller and Woodward demonstrate that the emphasis on becoming ordinary is important for immigrants and the population of North London more generally, and they call into question foundational principles behind anthropology, sociology and philosophy. Daniel Miller is Professor of Anthropology at University College, London. He is the author of many books, including The Comfort of Things, Stuff, and Tales from Facebook. Sophie Woodward is Lecturer in Sociology at the University of Manchester and the author of Why Women Wear What They Wear. "Miller and Woodward draw our attention to an ubiquitous aspect of modern living, one that rarely rises to the level of consciousness. Blue Jeans undeniably provokes. It succeeds at bringing the ordinary into plain view. After reading the book, I noticed how much more alert I was to the presence of jeans--who was wearing them and in what situations." -Robert J. Foster, author of Coca-Globalization: Following Soft Drinks from New York to New Guinea.